Held along the banks of the Thomson River, the Yellow Belly Classic attracts both the professional and novice anglers from near and far! The Yellow-belly Classic's objective is to promote and encourage fishing and tourism in the area – so grab the wife and kids and cast your line for a chance of some quality Outback hospitality, family time and you never know you're luck… you may just land yourself one of the great prizes they have on offer. Birdsville – we've all heard about this quintessential outback town and probably even really curious to go....so stop thinking about it and actually book your trip around the Big Red Bash! You'd be crazy not to! What is the Big Red Bash I may well hear you ask? Let me enlighten you....its 3 days and 3 nights of music featuring iconic Australian artists (think Jimmy Barnes, Paul Kelly and the like). But the Big Red Bash just isn't about the music, it's also out the people – meeting new people, enjoying their company and actually learning about them. It's about kicking back, relaxing and soaking up this Outback festival's vibe and getting abit of dirt on those feet of yours and abit of camp-site camaraderie! This event started from humble beginnings with a couple of locals trying to figure out how to put their town on the map! So it was decided, a triathlon would be held in a town known as one of Queensland’s hottest and harshest climates. The event grew in numbers and reputation and is now known as one of the toughest triathlons in the country and has even seen the likes of Olympians compete for the crown. But never fear, this Festival has something for everyone who doesn't run, ride or swim! You're bound to find something that takes your fancy from horse racing, bull riding, novelty events (cow pat throwing or fly squatting anyone? ), bog snorkelling (only in Australia right) or for those less inclined for the physical activities, you'll be treated to luncheons (now you're talking) and concerts! If you're wanting to get away this Easter and looking for a different experience, why not spend it in the Outback? I'll give you a couple of good reasons why you should! Waltzing Matilda Day Festival in Winton! The theme this year is “More than a Song” and once you've trekked the trails, stood in the shade of a Coolibah tree and soaked up the history – you will understand why “Waltzing Matilda” was in fact considered as our great Nations anthem! This Festival includes a 'bush christening' in the Pelican Waterhole, 'Mulga Bills' bicycle challenge, polocrosse challenge and even a beard competition (yes, that's right)! Pack your racing finery ladies and gents, and giddy up! The Easter horse races are a must! Held annually and usually in conjunction with the Boulia Rodeo and Camp-draft, the weekend offers something to suit all the family, punter and cowboy alike! It really doesn't get more “outback” than Windorah! Idealistic red sandhills, picturesque ruins, historical sites, and need I go on? Check out the Easter Fun Day which is held on the banks of the iconic Coopers Creek! Anything goes in this racethat requires teams of four to complete set obstacles against the clock and against each other. Food and bar available all day and a fun day for the family, participant and spectator! Join the locals for the Augathella Easter Diggers Rodeo! Cue the bulls, broncos, roping and wrestling, denim and big belt buckles.... this town sure knows how to a rodeo the right way! Go on; give it your best yee-haa! Join the tight-knit community and support an event that helps funds services such as the hospital and ambulance! Win/win really – experience a great day and helping such a worthy cause! For a change of pace and to wind down from all the thrills and spills of the day, why don't you drop a line in the Warrego River to catch yourself some yellow-belly (or try to) and have a night under the stars. No really...how's the serenity! Barcaldine Tree of Knowledge history lesson 101! The ghost gum, Eucalyptus Papuana, which grew outside the Railway Station, earned its claim to fame as the founding site of the political movement we now know as the Australian Labor Party. In May 1891, about 3000 striking shearers marched under the “Eureka” flag to put forward their protests against poor working conditions and low wages. Because the area beneath the Tree of Knowledge was the scene of actions and decisions which had a profound effect on the future of labour and politics in Australia, it has become an icon of the Labor Party and Trade Unions. The Tree of Knowledge was included in the National Heritage List on 26th January 2006 when sadly, it was poisoned by an unknown culprit. The famous tree has since been preserved and placed under an award winning timber structure that was constructed to protect the preserved tree and celebrate its importance as a place to meet and reflect, and remember those who fought for better working conditions. 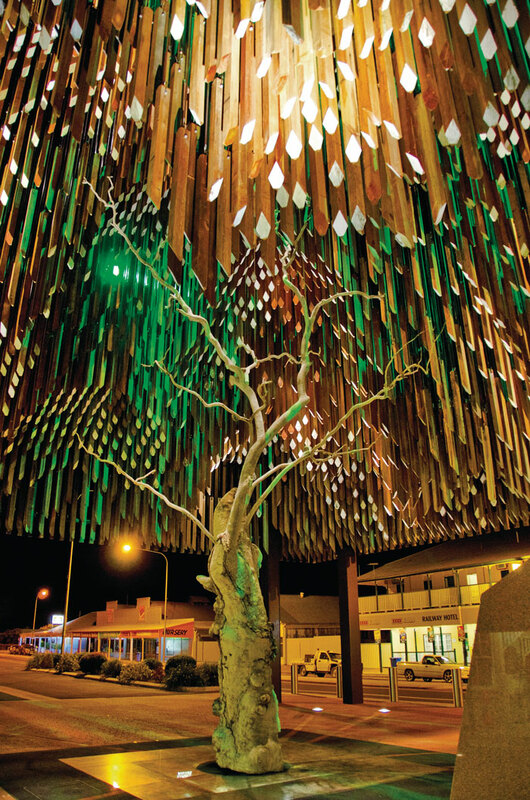 So now we are all up to speed, let’s talk about the fun stuff – The Barcaldine Tree of Knowledge Festival! Proceedings start on the Thursday evening with the re-enactment of the shearers strike, and into a series of art exhibitions, drag racing, horse racing, footy matches, Strikers town party and flock around the clock. The festival closes with the May Day March and celebrations. All in all, a pretty jam packed long weekend of fun and laughter and while you're there, don't forget to take in the beauty of the Tree of Knowledge itself – which is said to be impressive during the day, but truly magnificent at night! So, now you know some of Dan's recommendations, what are you waiting for? Start researching and book your next Outback break away. Immerse yourself it everything it has to offer and connect with nature in all its glory and who knows, you may even find yourself while you're there!